You are here: Home / Featured / Horse Jewelry: What’s On Sale? I don’t know about you, but sometimes, when I find that the need for retail therapy meshes nicely with my bargain hunting instincts. There’s nothing better than finding some new fabulous gold horse jewelry for the collection – especially when you don’t have to pay top dollar. In case you’re in that kind of mood yourself, I thought we’d look at some of the great pieces of gold horse jewelry that are currently on sale. Gold horse jewelry never goes out of style: while fashions come and go, the warm appeal of gold endures. 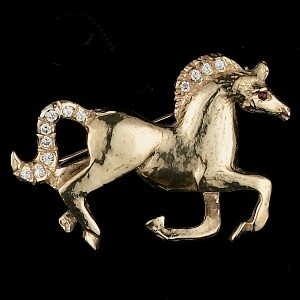 The first piece we’re going to look at is this fabulous 14K Gold Happy Stallion Pin. Check him out: can’t you just hear the triumphant thunder of hooves flying across the paddock? There’s .24 carats of diamonds in the mane and tail. The eyes are rubies. This is a classic, dynamic piece that would look fabulous on a blazer. Better still, this gold horse brooch was made in the USA. The price? $650. You’re saving over $1,450! And if you’re in the market for a gift that will impress without breaking the bank – we think we’ve found your answer! There are some great pieces of estate horse jewelry on sale. 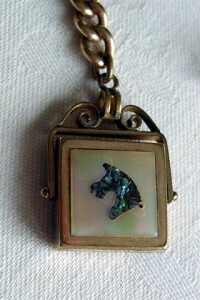 We love this rose gold plated antique horse head flip fob pendant. Rose gold frames a mother of pearl square: a horse head made of abalone is inset. On the flip side of the pendant, there’s a black onyx square. This flip fob pendant is a great piece for the person who appreciates one of a kind, unique horse jewelry. Rose gold is hugely popular this fall: many designers are working with this lovely reddish toned gold. This is a great gift item, for the fashion forward, teens who love unique accessories, or, of course, for yourself! Save $165 by buying now!